12 slices of back bacon, but you can use any kind of bacon you like. PEEL and finely chop the shallot and garlic cloves. GRATE the zest and squeeze the juice from the limes and set aside in separates bowls. 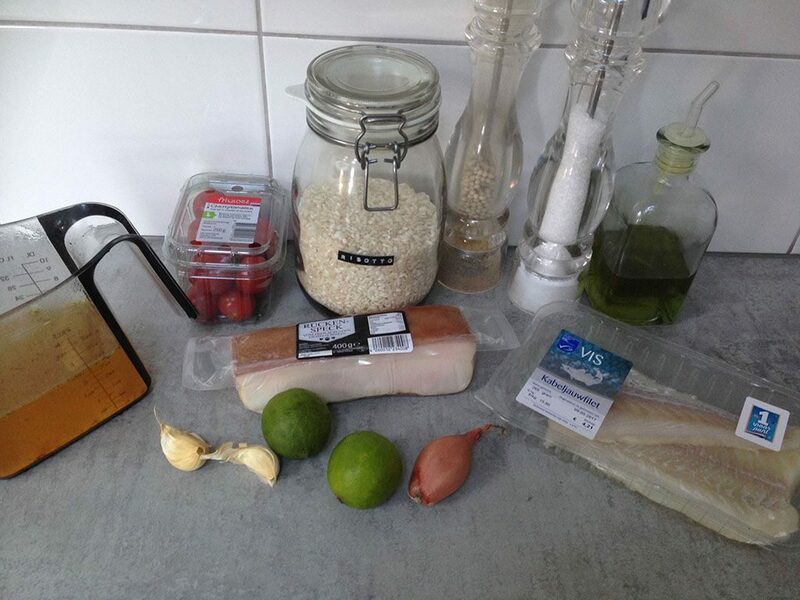 SEASON the cod fillets with pepper and wrap them with bacon slices. Don’t use any extra salt, cause the bacon is already kind of salty. Keep in mind the bacon will curl up during cooking. If you like you can serve some warm cherry tomatoes with this dish. You can warm them up in the oven with some olive oil, pepper, salt and garlic. You can also ADD them to the skillet along with the fish. HEAT olive oil in the large skillet and sauté the chopped shallot and garlic for a few minutes. 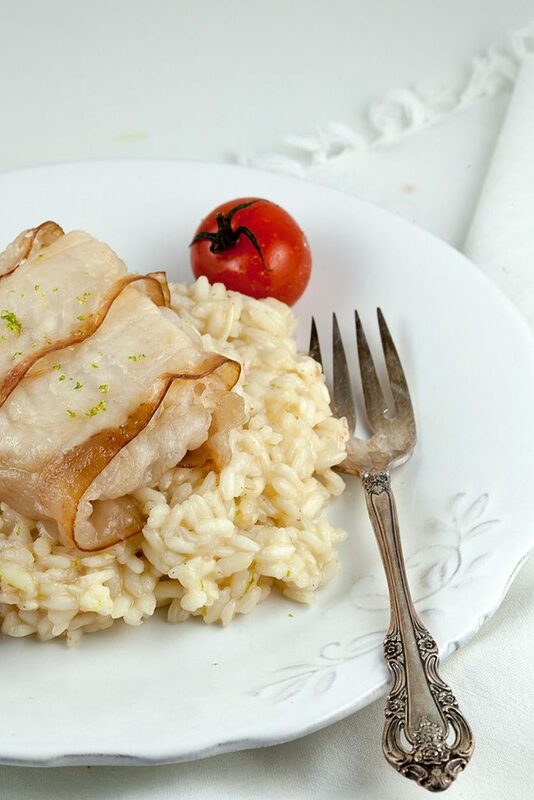 ADD the risotto rice, you’ll notice they’ve become glossy after a few minutes. Then also ADD the lime juice and then start gradually adding the vegetable stock. ADD the next spoonful as soon as the previous stock has been completely absorbed by the rice. REPEAT until all the stock has been used and the rice is cooked enough. SEASON with pepper and salt, turn off the heat and also STIR in the lime zest. 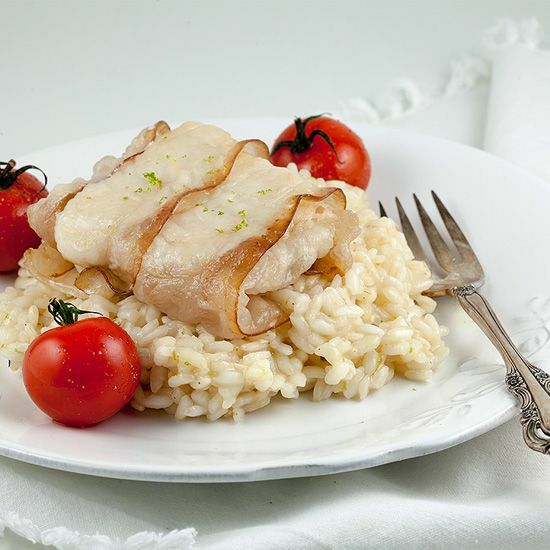 PLACE the bacon-wrapped cod fillets in the cold medium-sized skillet. Turn up the heat and you’ll notice the bacon will start to ‘melt’, that’s why you don’t need any extra addition of oil or butter. COOK the fillet on both sides for about 3 minutes. 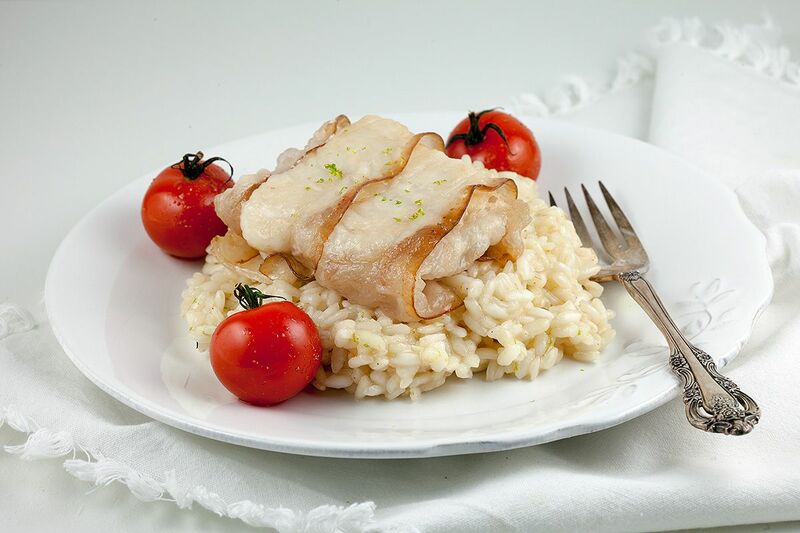 SERVE the fish with risotto, cherry tomatoes and salad. Enjoy!